In My Life star Christopher J. Hanke is set to be Rent 's next Mark Cohen. Longtime star Matt Caplan will play his final performance as the aspiring filmmaker on August 5, with Hanke starting two days later. "When I was at home in Texas, I remember listening to the cast album for Rent over and over again," Hanke told Broadway.com. "I was young, so I wasn't that confident, but there was a very specific moment where I turned to my best friend and said: 'I think I am going to play Mark Cohen on Broadway someday.' The fact that it is actually happening is pretty awesome. It is a huge honor and also humbling." Hanke is best known for playing J.T., a singer/songwriter stricken with Tourette Syndrome and a brain tumor, in the Broadway musical In My Life . 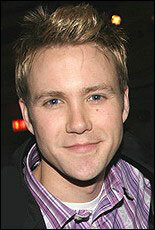 His other credits include Fame on 42nd St. off-Broadway and national tours of The Full Monty and Big River . Rent will continue to star Tim Howar as Roger and Antonique Smith as Mimi.